Liphatech’s latest Technical Bulletin provides an in-depth description of variables to consider when developing integrated pest management (IPM) programs in school settings. 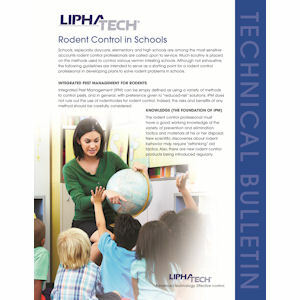 Authored by Ted Bruesch, Liphatech’s technical support manager, the bulletin covers plan development, the complexity of potential infestation areas, prevention tactics, elimination tactics and information on pests that you may encounter in school environments. It joins eight other Liphatech bulletins, on subjects including Understanding Rodent Behavior and Burrow Baiting. Pest management professionals may also contact their Liphatech district sales manager to receive a free copy.